Gluten Free Puffed Oat Cake Squares (formally known as Puffed Wheat Cake), are just as mouthwatering good as you remember as a kid. 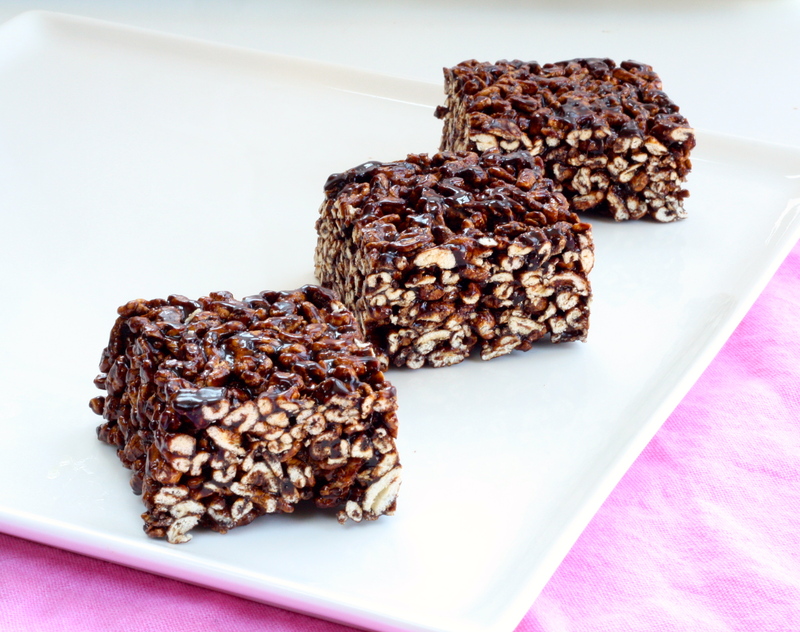 I used to love puffed wheat cake squares as a special treat or as a delicious snack. Now, you can make a gluten free version at home using oats. Yes, gluten free oats. They share a similar taste and texture and are a fabulous substitute for this old fashion favourite. In a large pot, add all the ingredients together (except puffed oats) and mix well. Melt all ingredients ensuring the sugar is dissolved and the mixture has just come to a boil. Remove from heat. Note: It’s important to not cook too long as you don’t want your sugars to cook to the candy stage as your squares will be hard. But you want to ensure all the sugar is dissolved and you are left with a nice silky chocolate sauce that is gooey and binds to the oats well. Once the sugars are dissolved and everything is blended, no more than a minute of cooking is required. Immediately turn off the heat and add the puffed oats. Mix together well and then carefully transfer to a butter greased baking tray. With the back of a wooden spoon or spatula, press the mixture until it fits tightly in the pan, making sure to get into the corners. If you find the mixture is sticking to your spoon, don’t worry. Just clean it off and then dip into a bit of water. This will prevent the sugars from sticking. Pop the tray into the fridge to cool, then remove and cut into bit size squares. Serve with milk and a great big smile. Trust me, regardless that these are gluten free, you’ll soon become the most popular mom (or dad) on the block! TIP: Why not try making these with puffed rice as well!? If you do, let us know how you made out and what brand of puffed rice you used. It’s always great to share gluten free cooking success stories.